According to a recent publication by Transparency Market Research (TMR), Tae Yang Corporation and Aspire Industries dominate the global butane gas cartridges market with a wide array of products and strong grasp over some of the key regions. These two companies are expected to remain prominent in the near future, although there is ample of opportunities for new entrants too, owing to the availability of raw materials and low capital requirements. The TMR report expects the competition in the global butane gas cartridges market to get stiff with growing rivalry between the leading two players and challenges coming from substitute products. Strategic alliances with regional players is benefitting the key players to expand their horizon. 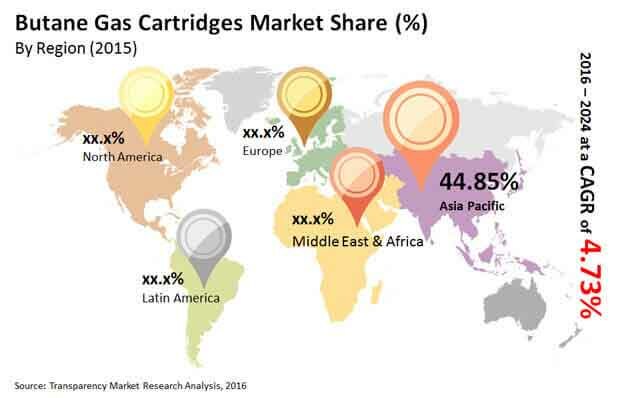 The report has estimated that the global butane gas cartridges market had an opportunity worth US$364.55 mn in 2015, and projects it to expand to US$555.24 mn by 2024, swelling at a healthy growth rate of 4.73% during the forecast period of 2016 to 2024. Application-wise, the report segments the global butane gas cartridge market into medical, stoves, pest control and fumigation, food and beverage, and others including the plastic industry and metal working. Out of these, butane gas stoves segment is most profitable, accounting for more than half of the demand in 2015. This high demand is a reflection of increasing demand for portable energy storage for camping activities and home cooking. The flourishing food and beverage industry, gaining from increased demand for quality convenient foods, will drive the demand for butane gas cartridge in this sector. For meat and fish processing, butane gas cartridges are used as blow torches. Geographically, the report studies the opportunities available for the players in the regions of North America, Asia Pacific, the Middle East and Africa, Europe, and Latin America. Currently, vastly populated Asia Pacific region serves the maximum demand for butane gas cartridges, which is a reflection of growing demand for butane filling machines and aerosol containers. China is the most important country-wide market for this market. However, the volatile price of butane is obstructing the market for butane gas cartridges from attaining its full potential in Asia Pacific region. Wholesalers, vendors, local traders, distributors, and e-stores constitute the majority of the value chain of butane gas cartridges market in various capacities in APAC region. Growing concerns over energy security across the world is the primary driver of the global butane gas cartridges market, as they provide easy portable options. Moreover, several consumers and industrial vendors are extending the demand for butane gas cartridges for applications in metalworking, fumigation, pest control, and sealing polybags. Furthermore, the segment of butane gas stove is gaining from thriving tourism industry involving camping. Low price of natural gas and crude oil, growing focus on energy security, superior efficiency in comparison to liquid or solid cartridge fuels, and increasing consumerism are some of the other factors favoring the global butane gas cartridges market. The author of the report shares a word of caution, saying “Several vendors in the global butane gas cartridges market are hesitant of extreme pricing pressure and hence taking careful steps to cope up with the losses. In this scenario, the integration of aerosol cans production to meet the demand is quite evident, which in turn is opening new opportunities in the regions where the demand for butane gas cartridges is volatile." The information presented in this review is based on a Transparency Market Research report, titled, “Butane Gas Cartridges Market (Applications - Medical, Pest Control and Fumigation, Stoves, Food and Beverages, Metal Working, and Plastic Industry) - Global Industry Analysis, Size, Share, Growth, Trends, and Forecast 2016 - 2024"